Warning! A serious, and not remotely joking note upfront: If you reply to this story, either in the comments here or on Twitter, you may be stalked by a known stalker. Please consider your self-care first and foremost. I am a survivor of online stalking. I don't talk about that much online because when online stalking is one of your triggers, talking about it online feels like hanging out a sign inviting people to hurt you. It'd be like posting a link to my email address, another link to icanhascheezburger, and mentioning off-handedly that I'm triggered by pictures of cats. I wouldn't deserve what happened next, but that doesn't make the fallout any less predictable. I know that simply existing on the internet as a woman means some people will try to cause me harm, so I try to navigate online spaces in ways which don't divulge certain triggers. Online stalking is serious. It ruins lives. It ends lives. People die from online stalking. It's not a joke or silly or funny or harmless. 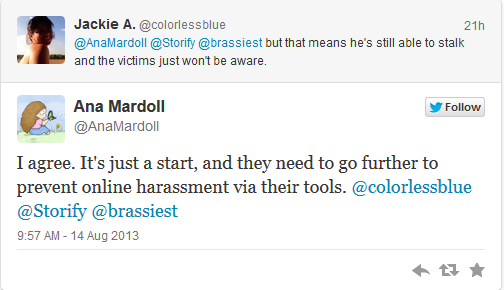 An anonymous account on the internet, a person who goes by the name of "ElevatorGate" -- which is in itself a reference to an incident where a prominent female atheist was propositioned in an elevator in a way which made her feel uncomfortable and possibly even unsafe -- has been abusing the social media tool Storify in order to stalk and harass women, especially trans women, online. And Storify has not only failed to take this abuse seriously, but has also chosen to abet his abuse in harmful and egregious ways. Let me back up. Yesterday I would have breathlessly told you that Storify was a valuable tool for compiling social media information. Twitter activism is powerful and meaningful, but Twitter makes it very difficult to compile lists of tweets (it's a 5-click process, at best, via Twitter). And Twitter also has a 3,200-search-limit on tweets: your 3,201th tweet, as well as every tweet before it, doesn't display in your Twitter account. That means that the only way I can access, for example, my filibuster tweets is via a laborious tweet-compilation process which Storify makes infinitely easier. That's when people are using it properly. 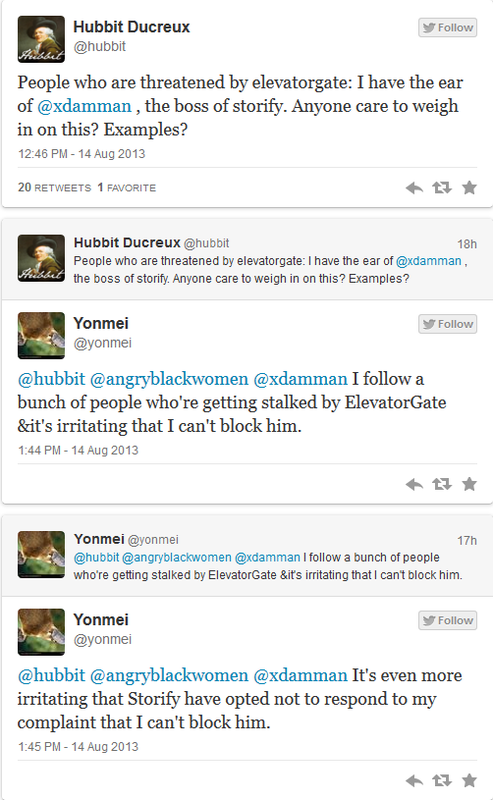 ElevatorGate has been instead using the Storify tool to obsessively compile the tweets of women he is stalking. Not tweets about activism or public events, or the sorts of things Storify is theoretically to be used for, but tweets about their favorite foods, about their daily lives, about their cat pictures. (I'm not going to link to examples of this and further victimize the women involved; suffice to say that I've looked through some of the 6,700+ Storifys in his profile.) He then uses the Storify "email notification" tool to spam the women he stalks with just that little daily notice that, hey, he's watching them. Every tweet they make. And storing those tweets up forever and ever without their consent. Including tweets which, taken in the aggregate, could be used by anyone online to identify or locate or dox these women. Several wonderful activists on Twitter who I follow have been speaking to Storify asking them to ban this user and delete his account. They have noted also that the Storify TOS must be updated to address people who use this valuable tool for stalking purposes. The Storify people have not been unresponsive, but they have (wrongly) seized on the belief that the real problem here is the "email notification" abuse and not the stalking behavior characterizing the compilations of this user. 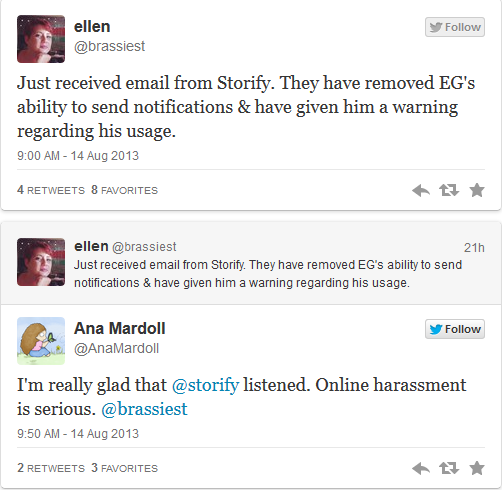 The Storify team alerted one of the activists that they had warned the stalker about his usage of the notification process and limited his ability to send notifications, though not his ability to continue to Storify. I was feeling really good about what I believed was an example of a social media platform's choice to take concerns about stalking and harassment seriously and respond in a way that meant someone sensibly reviewed the situation, saw that this was clearly not the use-case their service was intended for, and intervened in a sensible manner. I was reasonably confident that disabling ElevatorGate's "notification privileges" was the first step towards banning him, deleting his stalking Storifys, and hopefully modifying the TOS. Obviously this was the opposite of helpful, for a number of reasons, but I decided to assume that this was just a case of not fully understanding how stalking works and what Xavier Damman was asking of us. That's when he started quoting Voltaire at us, which someone should really add to the list of Official Logical Fallacies, because this is not a Free Speech issue. Storify is a service, not a government entity. And that tweet with the Voltaire quote? That is when it happened. Xavier Damman, who has 21,000+ tweets on his account, is the CEO of a social media company, and is specifically the CEO of a social media company that interfaces closely with Twitter and understands its internal workings, decided that using the term "ElevatorGate" (which is a very common term on Twitter, since it was a very well-known incident) wasn't appropriate for this conversation, and instead switched to using "@elevatorgate" which meant that the tweet was sent straight into ElevatorGate's mentions. That meant that every name in the tweet went straight to ElevatorGate's twitter page. It meant that ElevatorGate was directly made aware that he needed to click over to Xavier Damman's twitter profile to see who Xavier was tweeting to at that moment about stalking concerns. It meant that when ElevatorGate clicked over to Xavier Damman's profile, he could instantly see on a single page every user Xavier Damman had tweeted at regarding stalking concerns in his last 3,200 tweets. It meant that anyone searching for "@elevatorgate" on Twitter -- including ElevatorGate himself and his followers who immediately pounced on the mention -- was given our names and notice of the conversation. It meant that Xavier Damman sent an engraved list of People Concerned About Online Stalking to a Known Stalker that his company claimed to have already "warned" about stalking behavior. 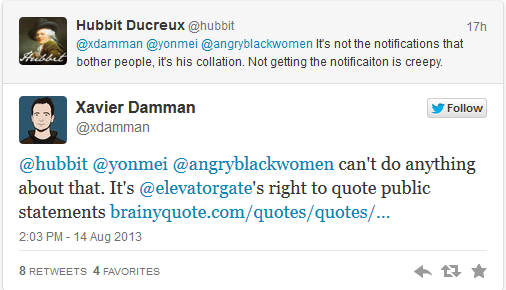 Literally within minutes of Xavier Damman's choice to tweet at ElevatorGate, I received a Storify notification that he was compiling my tweets (and that's just one of multiple storifys he made of me), along with the tweets of multiple other people who follow me and/or were participating in the conversation with Xavier Damman. Then more notifications from other Storify users who follow ElevatorGate, men calling me a "narcissist" and a "permavictim" for being angry that a powerful man deflected criticism by sending the names of his critics to a person he knows to be a confirmed stalker. I can block abusers on Twitter from contacting me (and ironically I had just this morning cleaned out my blocks from the filibuster live-tweeting! Wheee! ), but the only way I can block notifications from stalkers on Storify -- notifications, I will add, which don't just tell me I've been Storifyed, but also send the post title to me, which, yeah, there's no way to put something triggering in a post title, is there? -- is to turn off notifications (a big part of the Storify social media experience) and to essentially never use Storify again. 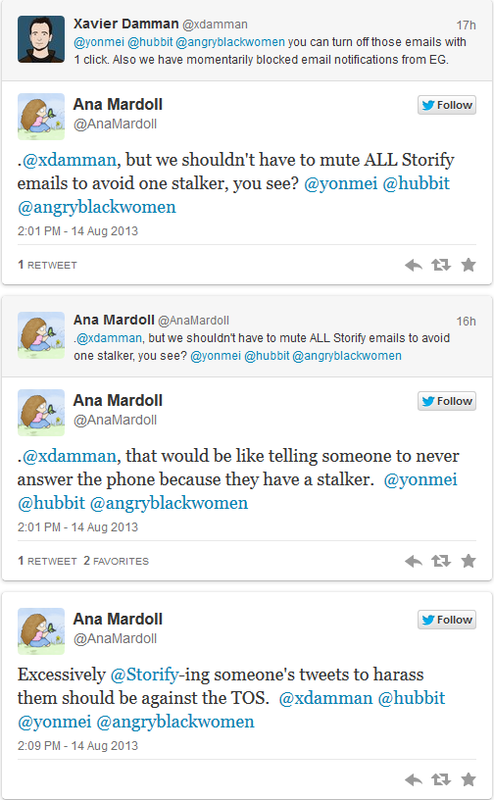 That's the solution I feel is being offered us: 'Don't want to get stalker-grams from Storify? 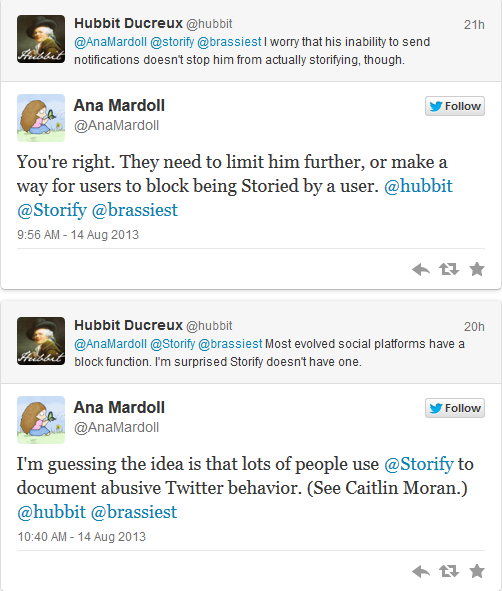 Don't use Storify! Turn off all the notifications and walk away!' That's a paraphrase and not a direct quote, but it's how I feel I am being treated. 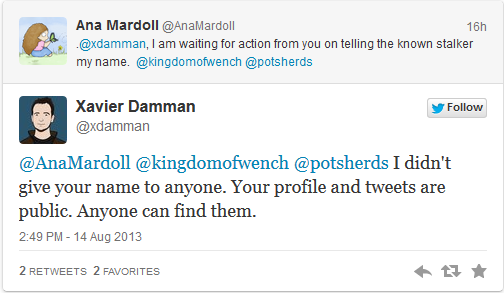 Xavier Damman isn't some newbie to social media who doesn't know how mentions work on Twitter. With 21,000+ tweets, he has 3,000 more tweets than @Shakestweetz. I, practically a Twitter neophyte compared to some, know how mentions work with less than 9,000 tweets under my belt. There is no plausible way that Xavier Damman doesn't know that he alerted a stalker to a conversation being taken place about him. There is no plausible way that Xavier Damman doesn't know that he sent a list of people who care about online stalking to a known online stalker. And while I can maybe, maybe, believe that Xavier Damman just didn't think about what he was doing when he did it -- because, hey, privilege-blinkers are real -- I cannot believe that Xavier Damman didn't know what he was doing when he dug in his heels and started insisting that he didn't do anything wrong, and conveying with his hastily-followed silence that his company isn't going to do a damn thing about placing me, and dozens of other people, on the radar of a man who they already know to be abusing their service in order to stalk and harass. 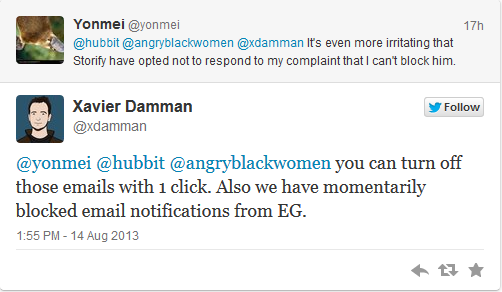 Storify and Xavier Damman owe me, and dozens of other people, an apology. 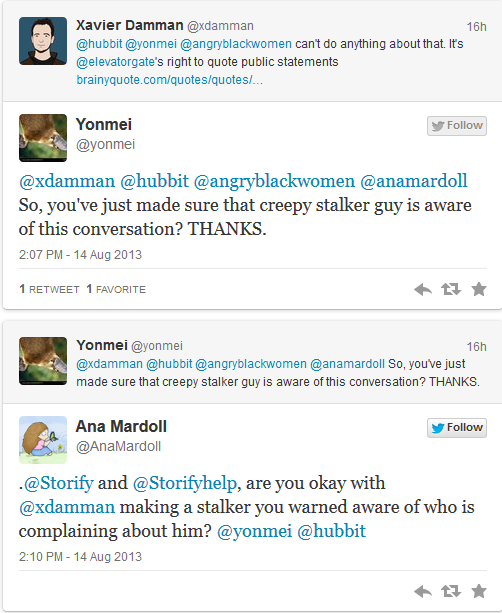 Storify and Xavier Damman owe us a change to their TOS to prohibit stalking behaviors. Storify and Xavier Damman owe us a statement that they have banned ElevatorGate and taken down his storifys. Meanwhile I'll be over here, explaining to my family, my friends, and my follows that I have a new stalker now and that they might all want to disassociate from me for their own safety -- and that no matter what Storify or Xavier Damman do, they can't protect me from the person they set on me, whether that act was careless or deliberate. What a terrible, horrible place for me to be in, to have to tell the people I love that being my friend might cause them to be harmed.